Caché Monitor supports multiple editors and results. The sql script is formatted and colored. Result sets can be viewed in text or table format. Color coding of syntax to improve the readability of complex statements. The text entered in the code editor is colored by category. The colors help you quickly find text in your code. Presentation of query results in either a grid or text window. A feature-rich text editing environment supporting find and replace, bulk commenting, line numbering and auto-complete. The graphical SQL execution plan uses icons to represent the execution of statements and sql queries in InterSystens Cachè. This graphical approach is very useful for understanding the performance characteristics of a sql query. 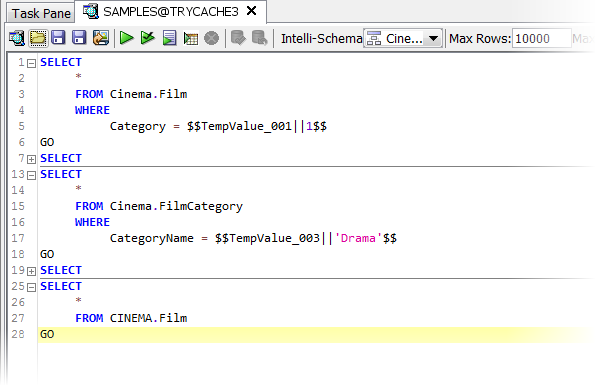 Index and selectivity information for used indexes are also available in the query plan. Caché Monitor is an multi-platform database management GUI that supports accessing InterSystems database Caché in many versions. Caché Monitor has been built for various Linux distributions, Mac OS X, MS Windows, and UNIX platforms. In addition to regular query and data browsing functionality, it includes several additional tools useful for database administrators and developers – which aims to help the DBA or developer of database application.